The net neutrality movement isn't dead yet. The Federal Communications Commission is facing another court battle over its decision to repeal net neutrality protections in December 2017. The tech-industry lobbying group Internet Association filed a motion in the U.S. Court of Appeals on Thursday asking the court to strike down the FCC’s order. “The internet industry will continue to fight for net neutrality protections that help consumers, foster innovation, and promote competition for the entire online ecosystem,” Internet Association CEO Michael Beckerman said in a statement. First and foremost, the Internet Association is concerned that regular internet users will be hurt by the deregulated internet. Like other net neutrality activists, the organization fears that internet service providers (ISPs) may privilege certain types of content over others, legally throttling and boosting download speeds for different services. 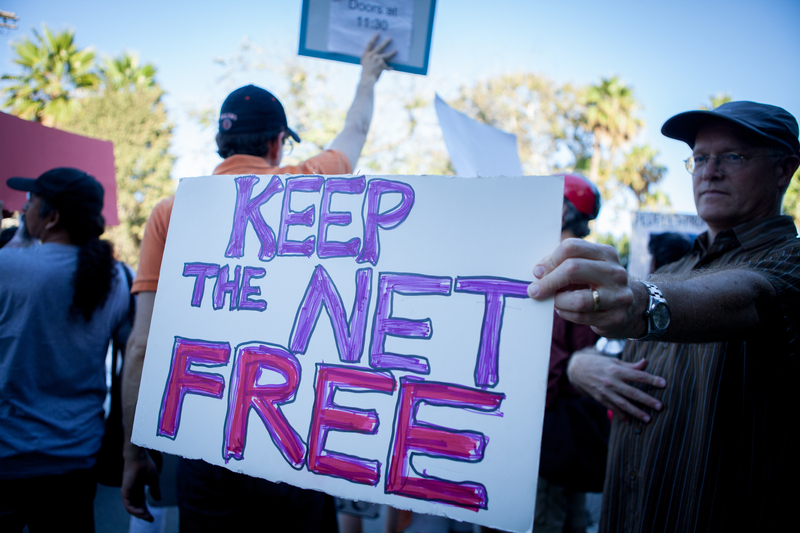 photo by Stacie Isabella Turk/Ribbonhead On July 23, 2014, hundreds of Free Press activists, allies and volunteers rallied for REAL Net Neutrality on President Obama's motorcade route as he attended a big fundraiser in the Hancock Park neighborhood of Los Angeles. It’s true: Even with complete transparency from ISPs, the lack of market competition for internet service means that there isn’t a marketplace for people to swap out their internet provider. It’s even worse in rural areas, where around 87 percent of customers have a single ISP serving their area. The Internet Association also says that the elimination of net neutrality could affect the financial viability of tech companies because the new rules eliminate a minimum standard of fair treatment. Without the stability guaranteed by net neutrality, online content providers may have difficulty securing funding and investments because ISPs could act as information gatekeepers. This means that investors would have to be sure that an ISP will provide good access to a website before making an investment. Lastly, the Internet Association warns that the loss of net neutrality could lead to a cultural shift online. The organization argues that net neutrality protections were key in facilitating innovation, and it’s unclear how ISPs unbounded by net neutrality will harm the internet ethos. Wednesday’s motion is part of a much larger movement to repeal the FCC’s order. More than 30 states are fighting back against the deregulation in some form, and Congress could still halt the new policy with a majority vote in both houses before the new rules go into effect on April 23.